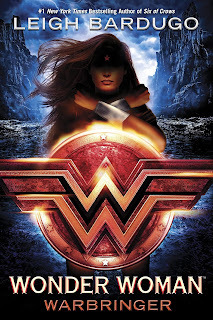 I am a big fan of YA and a big fan of Wonder Woman, which is why I was so excited to read Warbringer by Leigh Bardugo. But, this book was a BIG letdown for me. No matter how many times I picked it up, I could not get into it. When I finally did read it, it took me FOREVER. Not a good sign. Warbringer is a whole new Wonder Woman tale set when Diana (Wonder Woman) is a teenager. She saves another teenaged girl, Alia, without knowing this rescue would bring serious consequences to her home and the rest of the world. This is because Alia is unknowingly a warbringer. Now, I am not a comic book junkie, but luckily I have a husband who can fill in all the missing pieces for me when it comes to superheroes. However, this book completely disregards Wonder Woman’s origin story – rewriting a whole new story about teenage girl power instead. I was completely lost at times because it was like starting over with a character I already know and love. Then, the setting was hard to grasp. Is it modern day? Is it in the past? It seemed like it was supposed to be taking place today in New York City and back in Diana’s world, which was a little strange. Some of the things Diana was familiar with made no sense where others did not. Plus, I was not drawn to the characters or the plot. At all. Unfortunately, this Wonder Woman novel did not inspire any wonder for me. Even though I wasn’t a fan, I’d like to thank Blogging for Books for providing me with this copy for an honest review.